Whitemarsh Township administrative offices are located at 616 Germantown Pike, Lafayette Hill PA 19444; phone: 610-825-3535. Whitemarsh Township is a 14.53-square mile municipality located in southeastern Montgomery County. Incorporated in 1704 as part of Philadelphia County, it was one of the 28 original communities that comprised Montgomery County upon its founding in 1784. Adjacent to the Andorra section of Philadelphia, it is surrounded in Montgomery County by Springfield, Upper Dublin, Whitpain, and Plymouth Townships and Conshohocken Borough. It is also bordered by the Schuylkill River, which separates it from Lower Merion Township. The origin of the township's name has never been definitively determined, although there are various theories. One belief is that an extremely broad and level expanse of meadow along the Wissahickon Creek became a broad or wide marsh when subject to overflow; this natural feature may have been pronounced "white marsh" by German settlers, thus originating the name Whitemarsh. Another theory is that the name was suggested because the springs at Spring Mill rise from a marsh of white earth and sand, resembling pewter sand, and this may have suggested the name. Still another is that Whitemarsh received its name from the white mist that hung over the land on many occasions. The township's original inhabitants were Native Americans, members of the Lenni Lenape tribe. A peaceful tribe, they apparently lived in harmony with the township's first European settlers, English and Welsh Quakers, who endeavored to learn the Indians language and customs. Settlement began in 1683, only a year after Charles II of England granted William Penn his woods. Major Jasper Farmar, a British army officer living in County Cork, Ireland, heard of Penn's desire to colonize his grant, and purchased a 5,000 acre tract containing most of what is present day Whitemarsh. The tract stretched from the Schuylkill River to the Wissahickon Creek. Unfortunately, Farmar died as arrangements were being made to sail to America; however, his widow and children decided to make the voyage. The family, along with several servants, arrived in Philadelphia on November 10, 1685. Surveying their tract, they chose the Fort Washington area for their homestead. The Widow Farmar apparently did not survive for long in the new land, for her son, Edward, who inherited the tract, began to subdivide it into parcels of 100 to 200 acres during the 1690s. These parcels were sold to Quakers and later, German immigrants, as farms. Sometime between 1690 and 1700 Edward Farmar donated land for the township's first church, St. Thomas'. The congregation is still active today, making it the township's oldest and one of the oldest in Pennsylvania. Another early church is the Plymouth Friends Meetinghouse, organized in 1686. While largely in Plymouth Township, this church was instrumental in the growth of the Plymouth Meeting section of the township, which was one of the earliest settlements in Whitemarsh. In 1686, an event occurred in neighboring Oreland, which was to have a profound effect on the township. A man named Thomas Fitzwater discovered vast lime deposits on his land. He erected a kiln to process it, which, by 1693, had attracted the attention of Penn. Penn ordered a highway built from the port of the Delaware River to the kiln. Named Limekiln Pike, and still in existence today, it was one of the first roads in the area. With subsequent deposits being discovered in Whitemarsh, limekilns began to appear throughout the township, creating its first and most noted industry. The pattern of the township's early settlement was not dissimilar from the rest of the region, or indeed, from the rest of the country. Roads were laid out to link mills, churches, farms, and limekilns. Villages began to appear at important cross roads, encouraged by the development of taverns or inns which started to appear in earnest after stagecoach service was introduced to the county in 1763. Important early roads traversing the township include: Germantown Pike, which existed as early as 1687; Bethlehem Pike, which was developed to facilitate the hauling of lime in 1698; Ridge Pike, opened in 1706 to provide a connection between the Wissahickon and Perkiomen Creeks; and Skippack Pike, first used in 1713. 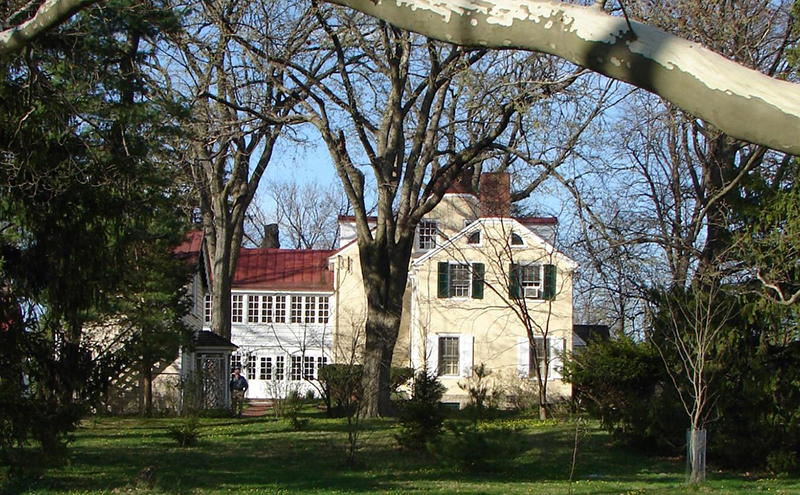 During the Revolution, Whitemarsh hosted several important events relating to the war. During the fall of 1777, General Washington and 11,000 troops were stationed in the township, guarding the Wissahickon Valley from British redcoats, who then held Philadelphia. Washington's encampment extended from Militia Hill on the west, over Fort and Camp Hills, to Edge Hill on the east. It was during this time that these hills received their names, Militia Hill was named because it was held by the Pennsylvania Militiamen, Camp Hill because it was dotted with tents, and Fort Hill because it contained the fort. There is no surviving documentation on why Edge Hill was so named. Several township buildings still stand that played a role during this time. Surgeon General John Cochran stayed at Hope Lodge and General Biddle stayed at what is now the Clifton House on Bethlehem Pike. During December 5, 6, and 7, 1777 there were skirmishes between the Revolutionaries and General Howe's troops in the Flourtown area. They ended when a British attempt to capture Fort Hill was thwarted because their cannons could not traverse the terrain between Flourtown and the Hill. Shortly after that Washington and his troops decamped for Valley Forge. Lafayette Hill was also the site of some activity. St. Peter's Lutheran Church was used by both armies as a stable and battery. In 1778, General Lafayette established an outpost at the church to protect Valley Forge from a British assault leaving Philadelphia via Ridge or Germantown Pikes. Left in ruins after the war, it was not rebuilt until 1809. The present structure dates from 1901, replacing the earlier building, which burned in 1899. Spring Mill: This area takes its name from the springs which create a small stream that leads to the Schuylkill. About 1712 or perhaps earlier, a gristmill was developed along this stream, leading to the development of the village. The mill burned in 1968, but two houses associated with the mill still stand, surrounded by a SEPTA parking lot near the corner of Hector Street and North Lane. Barren Hill: Settled by Germans, this area developed in the early 1700s, because of its close proximity to Germantown and Ridge Pikes. The origin of the name is obscure. Some references claim that it was a corruption of Barn Hill, others cite the sheer desolation of this area. Plymouth Meeting: Named after the Plymouth meetinghouse, this area was settled as early as 1686. The present meetinghouse dates from 1708. Part of this historic area lies in Plymouth Township. Lancasterville: This area, which was located near where the turnpike crosses Stenton Avenue, got its name from the Lancaster family who owned several large farms in the vicinity. Largely obliterated by the turnpike, it has disappeared from modern maps. Fort Washington: This area takes its name from General Washington's encampment of 1777. It evolved after a railroad was put through the area, starting in the 1850s. A village grew where the tracks crossed Bethlehem Pike. It was named in 1878. Valley Green: Originally known as Farmar's Town for Edward Farmar, this area, located near the present day Philadelphia Cricket Club, probably received its name from its natural setting in the Wissahickon Creek corridor. With the exception of Valley Green Road, the name has disappeared. See Figure 2-1 on page 6 for the location of these areas in 1877. The growth of these areas was undoubtedly helped by the transportation improvements that occurred during the 19th century. Reflective of similar developments throughout the East Coast, a canal along the Schuylkill River, conceived in 1810, was completed in 1825. Ten years later, a railroad was constructed through the township along the Schuylkill. It connected Philadelphia with Norristown. By mid-century numerous rail lines ran throughout Whitemarsh. They were followed by streetcars in the 1870s which provided passenger service to the City and such local boroughs as Norristown, Conshohocken, and Ambler. Yet, these improvements did not lead to the late 19th century garden suburbs created in such areas as Wyndmoor in Springfield, Wyncote in Cheltenham, or Wayne along the Main Line. Whitemarsh remained a community of small villages and farms, except for some development radiating out of Conshohocken. One explanation for this was the rapid growth of Conshohocken and Ambler during the 19th century. Their activity absorbed most of the area's growth and allowed Whitemarsh to remain unchanged. Of the 19th century villages, six still appear on maps (Spring Mill, Plymouth Meeting, Barren Hill, Cold Point, Broad Axe, and Fort Washington). They have been joined by four others: Lafayette Hill; Miquon — originally the Lafayette station area, this stop was named Miquon in 1921 to end confusion with Lafayette Hill; Harmonville, named after a shopkeeper who lived in the area; and Cedar Heights, the name of an early 20th century subdivision. While these transportation improvements brought relatively little residential development, they did create a lot of industry. From a township that had 5 inns, 5 gristmills, 3 paper mills, and 2 tanneries in 1785, Whitemarsh developed a respectable industrial base by the late 19th century. Industrial corridors emerged along two rail lines: the Plymouth to Oreland rail line and the Schuylkill River oriented rail line. The Plymouth/Oreland line, developed because of Corson Quarry, caused this business and several other similar industries to boom. Today Corson's, now known as Highway Materials, is the only quarry still in operation. It is the oldest continuously worked quarry in the United States. The Schuylkill line saw the development of much heavy industry, including: Hamilton Paper (later Weyerhauser and then Simpson Paper Companies), Lee Tire, Hale Pump, and Quaker Chemical. While many of the industries are gone today, some of their buildings remain; silent reminders of the Delaware Valley's smokestack era. Present day Whitemarsh emerged after World War II. A demand for new housing, created by a shortage caused by the Great Depression, was coupled with low interest government mortgages, resulting in the nation's greatest housing boom. Additionally, automobile ownership was now available to the general public, allowing city residents the chance to venture beyond public transit corridors. This made the farmland of Whitemarsh appear very attractive. The birth of the modern suburb had begun and Whitemarsh's location adjacent to Philadelphia put it in the path of the first wave. The growth was staggering. From a population of 4,855 in 1940 the township grew to 12,286 in 1960. During the 1950s the amount of housing in the township more than doubled. Much of this growth radiated out from the Ridge and Germantown Pike corridors. Typical of large scale subdivisions, the land first to be developed was the easiest-the flattest. During the 1960s and 1970s, the housing development grew out to Flourtown Road, creating a continuous developed suburban community between the Ridge Pike corridor and this area. In the southern and western areas of the township only the Barren Hill and Miquon areas, with their steep slopes, remained undeveloped. In the township's central and northern sections, the Erdenheim Farm, Corson Quarry, State Park, and several other farms and country estates served to limit the penetration of tract housing into these areas. However, by the 1980s housing began to appear in these areas and development pressures continue to this day. To continue to guarantee that the township remains a desirable place to live, present and future residents would do well to understand and protect the characteristics that have given Whitemarsh its persistent appeal and vitality. Township of Whitemarsh, 2003 Comprehensive Plan, www.whitemarshtownship.org, accessed November, 2017.